Then the obvious is to let the seed pods mature on the Cypress Vine. 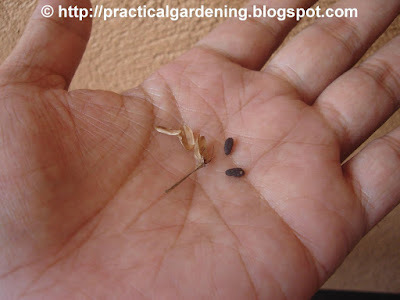 Here, I allowed several seed pods or "fruits" to stay on the stems so I could "harvest" the seeds for storage. You may then take them and dry them somewhere safe. Or you could leave them on the vine and let them dry up there. Be sure to dry them well before storing, and store them in dry containers or packets.